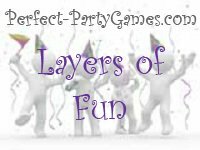 Summary: Layers of Fun is a game where the guests unwrap several layers of wrapping paper to get to the prize. Place the gift inside the gift box. Cut out the 10 different types of wrapping papers to fit the size of the gift box. Cut out each stanza of the Layers of Fun poem so that you now have 10 pieces of paper. 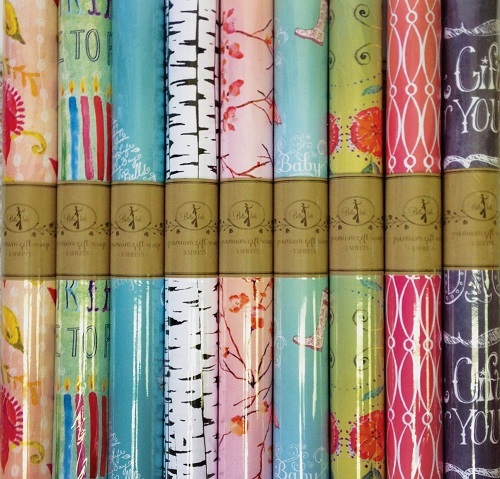 First, wrap the gift with one sheet of wrapping paper. Nest, tape the last stanza of the poem to the inside of one sheet of wrapping paper, then wrap the box again. Tape the next to the last stanza to the inside of another sheet of wrapping paper, then wrap the gift box again. Continue this pattern until the gift box is wrapped 11 times total and 10 of the layers contain one stanza from the poem. Have the guests sit in a circle. Let the Guest of Honor begin the game by unwrapping the first layer of wrapping paper and reading the first stanza of the poem out loud. The gift is then passed to the person in the circle who best matches the description of the stanza. For instance, the first layer will reveal the words "Who here has the longest name? This is where we'll start the game." The player that unwraps the sheet of wrapping paper that contains the last stanza, wins the game and gets to keep the gift inside the box. Who here has the longest name? This is where we’ll start the game. It goes to the one with the smallest shoe. You’ll need to pass it over there. “But I want this gift,” did I hear you say? Pass it three to the right anyway. Count the change you brought with you. If you have the most, this gift’s for you. Sorry, it’s going to take more than money. Pass it to the wildest outfit, Honey. Count your siblings, every one. The most deserves this box of fun. This gift is now presented to you. This gift now belongs to the one with the most. We’re ending this rhyme. This is the last poem. The gift you are holding, is yours to take home!! !